Make Money Clearing Out Your Clutter! Click REGISTER TO CONSIGN below. As a consignor, you earn 60% of your sales, less a $10 consignor fee. Join our team to earn 70%! Our average consignor sells over $400 of their items! We break down the consigning process step-by-step. We are here to make selling easy! After your items are prepared, drop them off at the sale, and WE take it from there! Pick up your unsold items after the sale, or donate to our charity partners! ...and within two weeks, you'll receive your check in your email! Do you have unused and outgrown infant, children's and maternity items cluttering up your house? When was the last time your kids used the toys at the bottom of the bin? Would you like to earn money on those items? Money you can use for vacation, kids activities, the next season's clothes, or Christmas presents! YES? Then JBF is for you! You prepare the items and drop them at the sale and then WE do the rest. We ensure thousands of shoppers come to the sale in ONE weekend! The average consignor sells over $400 of stuff! Are you sick of earning 50 cents on items at a yardsale, or wasting your time on no-shows at Craigslist meetups? Who has time for that!? We've been there too, and that's why we love JBF! No haggling, no meetups...just an easy way to earn CASH on your CLUTTER. What are you waiting for? CLEAR OUT & CASH IN! JOIN OUR TEAM, EARN MORE! Join the JBF community! Team member schedule opens 8 weeks before the sale. **All team members also get to shop FIRST at our regular presale and 50% off presale! The more you volunteer, the earlier you shop! Shop even earlier by becoming a "Perfect Consignor"! Bring less than 5 stained/rejected items this season, and get a 30 minute head start on your shopping time next season! At drop off, we inspect your items AFTER you have dropped them at the sale. No waiting in long lines, no awkward inspections. You will place all of your items on the sales floor and they will be inspected AFTER you drop them off. Items that do not pass inspection will be held for you to pick up, or automatically donated if marked "donate". Watch your sales LIVE on our online tagging system. It's that easy! You may pick up your unsold items or donate some/all of your items to our charity partners. Pickup is QUICK and EASY, as all of your items will be sorted for you in a neat little pile at pickup. No running around the sales floor trying to find your stuff. We do the work for you! 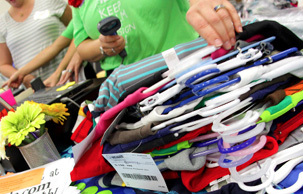 Consignors bringing over 300 tags, who are NOT donating their items, are required to help 2 hours during the sorting shift (Saturday, May 11th 6:30-8:30pm). These 2 hours DO NOT COUNT toward the 4 volunteer hours needed to earn an additional 10% of sales (they are in addition to those hours). EVEN IF YOU HAVE CONSIGNED WITH US BEFORE, you must register for our sale EVERY season. Login to your consignor profile (or if you have never created a profile, create a new one) by CLICKING HERE. Locate our sale called "Quakertown/Hatfield". If you do not see it, search by zip code. Click "sign up" and check the "consignor" box. That's it! You should now receive a confirmation email with lots of information on consigning! After you have registered, you are eligible to join our exclusive Facebook consignor group. Click here to join. It's time to gather all of the items that have been outgrown, unused, and are sitting around collecting dust...and turn them into CASH! Go from room to room, checking closets, the play room, basement, garage, and outdoor toys. Click here for items that are acceptable at our sale. Collect supplies you will need for cleaning and tagging including hangers, magic erasers, stain sticks, febreeze, safety pins, a tagging gun (optional), cardstock, curling ribbon, ziplock bags, batteries. Dollar Store items will do! As you are collecting, check the Consumer Product Safety Commission for recalls of your items. All recalls must be fixed prior to the items being sold at our sale. Click here to check for recalls. Please contact us at kendrasalem@jbfsale.com or barbaraborascius@jbfsale.com with any questions! JBF is known for having great quality items availble to our shoppers! Shoppers are looking for items that are clean, stain-free, and in great shape. We have implemented a "rejected item fee" - for each "no thank you" item after the first 7, consignors will be charged $.25/item. Most of our consignors DO NOT incur this fee, since they bring us great quality items. Must look and smell clean. Try washing with oxiclean, a stain-stick, or spray with febreeze. If clothes are wrinkled throw them in the dryer with a wet washcloth, or run an iron lightly over your items. Must be like new! Please bring only your best! We will not accept items with excessive wear, scuffs, or worn-down rubber soles. Magic erasers help clean up shoes really well. Some shoes you can put right through your washer and dryer! Must be in good shape! Make sure there are no missing pieces. All toys must have batteries if needed (dollar store batteries will do). Wipe down the items to remove all dirt and dust. Magic erasers take crayon right off of toys and desks, etc. All children's furniture is acceptable. Please make sure furniture is in good condition. Only children's furniture will be accepted, no general home decor please. Clothing must be hung on appropriately sized hangers. Hangers are available for free at stores like Old Navy, Carters, OshKosh, Walmart, and Target. You may also purchase hangers at the Dollar Store or Walmart. See the tagging how-to videos HERE for how to attach items to the hangers so that they do not fall off. The videos also outline how to attach pants and outfit sets. Hangers must look like a "?" with the opening to the left. Items should be secured with safety pins so they stay on the hangers. Outfit sets should be safety pinned together with the safety pin also around the hanger itself, so that the pants do not weigh down the shirt causing a hole or tear. See tagging how-to videos for further explanation. For maternity items, please pin tops to the hangers so that they do not fall off. Please use pants hangers or safety-pin pants to the clothing hanger so that they are visible and upright. Pants folded over hangers will not be accepted. Pairs of shoes should be secured together with zip ties or curling ribbon (again available at the dollar store). If they cannot be secured together you should place them in a clear ziplock bag. Small parts should be placed in a ziplock bag and secured to the larger item (if they come in a set) with packing tape. Boxes for games and puzzles should be taped shut (try painters tape so the box doesn't rip). Items should be secure and contained. Try using clear plastic wrap on wooden puzzles to keep the pieces in place. Tape all bags shut with packing tape. Items that sell well on hangers are blankets, diaper bags, infant carriers, sheets, towels and backpacks. Please secure the items to the hanger with a zip-tie or curling ribbon. There are lots of tagging videos on how to prepare items which are less than 3 minutes in length. See the videos HERE. CLICK HERE to login to your JBF account. Check to make sure you are signed up for our event. Even if you have consigned with JBF before you must "sign up" for each sale you intend to participate in. Once logged in, click "Enter My Tags"
Using our Pricing Guidelines enter each of your items. We generally recommend pricing your items at 1/3 retail price. Think, "what would I pay for this item?". We also recommend pricing your items at 50% off for our half price day for the selling success. It is up to you whether you choose to pick up or donate your items after the sale. Print your tags on white cardstock. Tags will not be accepted on plain paper, as they tear off and are lost too easily. Attach tags to your clothing items using safety pins or a tagging gun. Please see tagging gun guidelines HERE so that you do not put holes in your clothing making them unsellable. Tags attached with safety pins should be placed on the upper right hand corner of the item (when you are facing the item). Tags attached with a tagging gun should be placed through the tag of the garment or straight through a seam, NOT through the fabric of the item. Store your items in bins and boxes in a clean dry place, until you are ready to drop off at our sale! Consider placing a dryer sheet in the box with clothing or linen items to keep them smelling fresh! Again, if you are more of a visual learner we have lots of tagging videos for you to view. All videos are less than 2-3 minutes in length. VOLUNTEERS AND CONSIGNORS SHOP FIRST, AT OUR EXCLUSIVE PRESALES! You will receive your presale passes at consignor drop off. Friday, May 10th - Half-Price Presales! Children and infants are welcome during all shopping times. Please keep in mind that presales and first public shopping times can be very busy and overwhelming for children. We recommend wearing your child in a carrier or using a stroller or wagon. Consignors from the Fall 2018 season who brought less than 5 rejected items to the sale are considered "Perfect Consignors". These consignors will get a 30 minute head start on their respective shopping time listed above! Thanks for bringing us great items!! The Perfect Consignor list can be found HERE. Let us do it for you! To learn more about our Valet Consignor Program, click the "Valet & Vendors" page above. Hello! We are Kendra and Barb, a daughter and mom team who organize the JBF Quakertown/Hatfield and Allentown/Bethlehem sales. We are avid shoppers and deal-hunters and we GET IT, raising kids is expensive. After shopping other local JBF sales and finding like-new items for CHEAP, we knew we had to bring JBF back to the area. We love helping thousands of moms, dads and grandparents, just like you, to earn money on their kids' outgrown items, and to save money shopping at our sale. Whether you SELL or SHOP with JBF (or both), we hope to put extra cash in your familiy's pocket!